This week on RFC Extra: We talk about May Mayhem, the SDCC Combiner Wars Devastator, Unite Warriors Defensor and that Deluxe Groove. Oh, and we talk about the latest Botcon registration delay. Fun times on this week’s RFC Extra! 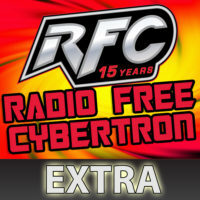 This week on RFC Extra: Don’s super secret declaration, the “Fred’s” Legends class Ultra Magnus, Cliffjumper and Skywarp, the Botcon set, embargoes, Gift Sets for Future CW figures?